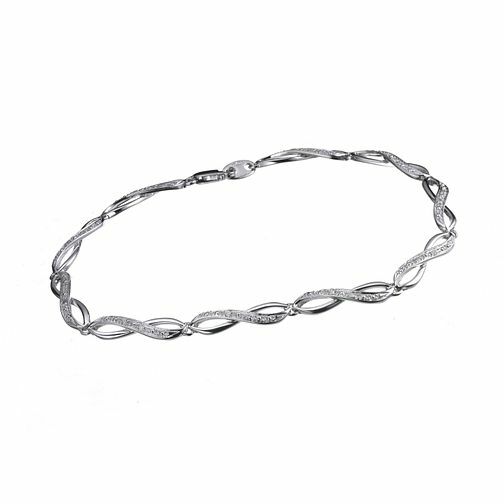 This 9ct white gold bracelet is intertwined with diamonds. It's a sophisticated style that you'll want to wear at every opportunity. An elegant twist and a sparkling turn. 9ct white gold diamond bracelet is rated 4.5 out of 5 by 2. Rated 5 out of 5 by Leona from Beautifully elegant bracelet Beautiful bracelet, fine craftmanship and delicate details make this bracelet a delight to wear and a pleasure to receive as a gift. I wore this bracelet along with the matching earrings on my wedding day which added the finishing touches to an elegant and memorable day.